Records were shattered during the final day of the 2010 NSDA CANIDAE Pet Foods Nationals at Lake Elsinore Motorsports Complex in Lake Elsinore, CA. Scott Whipple and tuner Famous Amos Satterlee left everyone in amazement with a string of 2.2 second passes culminating in the quickest run in sand drag racing history with a 2.221 during his final round Top Fuel victory. The run will also stand as the Top Fuel World Record as Scott’s prior 2.255 is sufficient back up for the record to be certified. The action was also hot in the Top Alcohol class. Both Gary Mink and Dan Allen looked to be the class of the field all weekend, knocking on the World Record on every pass. In the final, the Allen Racing crew broke a fuel line having to be shut off while defending champion Gary Mink went on to take his first win of the 2010 season. In the Super Eliminator class, it’s beginning to become routine as it was once again Billy Morris and Paul Taylor facing off in the final round. The outcome would be the same as Billy would have a great reaction time and take home his second SE class win to start the season. Local favorite Paul Graham waded through a tough Top Eliminator class to take home his first NSDA TE class victory at the Inaugural Lake Elsinore race. Other winners on the day were Mike Gazzeny (Pro 1), Wes Johnson (Pro 2), Arend Schouten (Pro 3), and Mark Ratliff (Motorcycle Pro 1 & 2). Day two of the NSDA CANIDAE Pet Foods Nationals at Lake Elsinore Motorsports Complex saw some amazing action. In the Top Fuel class, Scott Whipple set the bar high with a spectacular 2.255 in the final qualifying session. Gary Mink showed why he is the defending Top Alcohol class champion running a 2.41to take the top spot into race day. 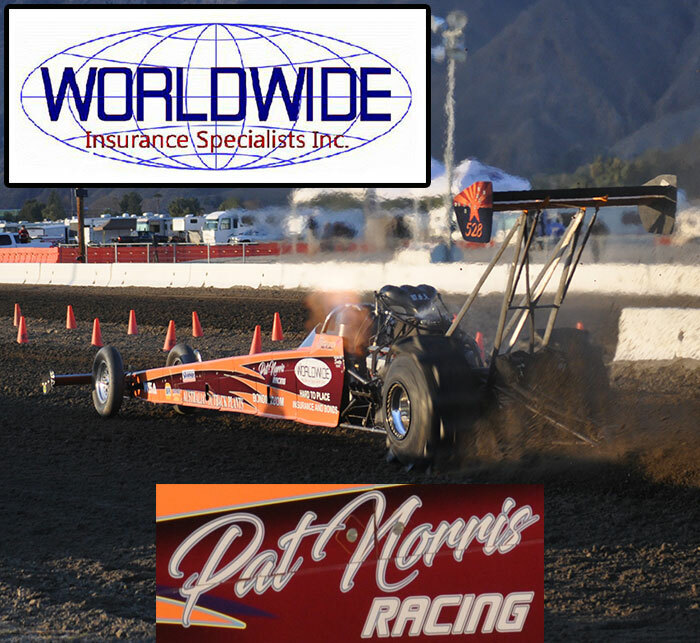 Billy Morris continued to lead the pack in Super Eliminator with a 2.809 while Paul Graham also held on to his top spot in the Top Eliminator class with a 2.97. Mike Erwin (Pro Outlaw) and Clayton Record (Pro Mod) were big winners on the day as were Al McKinney Jr. (Sportsman Car), Joey Weaver (Motorcycle Sportsman), and Christian Payne (Junior Dragster). Day one of the NSDA CANIDAE Pet Foods Nationals is in the books and it appears as though the new Lake Elsinore Motorsports Complex sand drag racing facility is shaping up to be an amazing race track. Geoff Gill, in his first race of the year, led Top Fuel qualifying with a sizzling 2.314/160mph in the second qualifying round. The Top Alcohol class saw some great passes as Gary Mink led the pack with a 2.45 followed closely behind by Dan Allen in the LUCAS Oil Dragster with a 2.47. Billy Morris backed up his great performance in Super Eliminator at the Season Opener by leading qualifying on day one with a great 2.809. The Top Eliminator class was led by Paul Graham with a nice 2.977. Wes Johnson once again took the Pro Gambler class win over his brother Charlie. Racing action continues on Saturday with more Professional qualifying as well as Sportsman and Kids class eliminations. - Geoff Gill also ran quick time of the first session with a 2.438/124.62 pass. - Dennis Rieck went 2.57 on his first pass, then improved to a 2.50 on the second run. - Scott Whipple had problems and clicked it off way early on the first pass. On his second qualifying round attempt, the chutes deployed as he rolled up to the starting line. They were able to pack the chutes and make a pass that didn’t count towards qualifying where he would run quick time of the day with a 2.313. - Gary Mink had a .973 60’ on his 2.45 pass. He also ran quick time of the first session with a 2.531. - Dan Allen ran a nice 2.477 on his second qualifying round. - Mike DeNunzio had some problems on his 2.76 opening qualifying pass, but they will be ready for Saturday. - Jim Hammond had a monster wheel stand in the second qualifying session, causing some major chassis damage. Jim plans on transplanting his drive train into his old chassis to complete the weekend. - Shane Sanford had a pretty looking pass in the first qualifying session, but rolled the beams coming up with a 4.41 ET. His daughter, Ashley made her first licensing pass in the car for Super Eliminator earlier in the day.